I needed a new tree skirt. My beautiful expensive tree skirt smelled like cat pee when we pulled it out of storage this year! Noooooo! Do you know how hard it is to find a nice big tree skirt? These days most of them don't even cover the base of the tree. So I set out on a mission to make a giant DIY tree skirt. Turns out, it's super easy to make an extra large Christmas tree skirt for under $10 with supplies from Walmart. WHAT?! Yes, yes it's true. A giant DIY Christmas tree skirt miracle! This No-Sew DIY tree skirt goes together really easily and you don't even have to be “crafty” to make it! Measuring a little over 6 feet wide, this felt tree skirt will be big enough to catch all the needles from our tree and have space to put gifts on. Because felt is so dense, it will catch the needles from the tree, glitter from ornaments, and other particles. Carefully run the vacuum right over the felt tree skirt to clean it. You can also machine wash the tree skirt; Kunin Eco-FiPlus™ PremiumFelt washes up beautifully and easily! You'll need a few supplies for this Giant DIY Christmas Tree Skirt project, most of which can be found in the sewing aisle of your local Walmart or craft store. 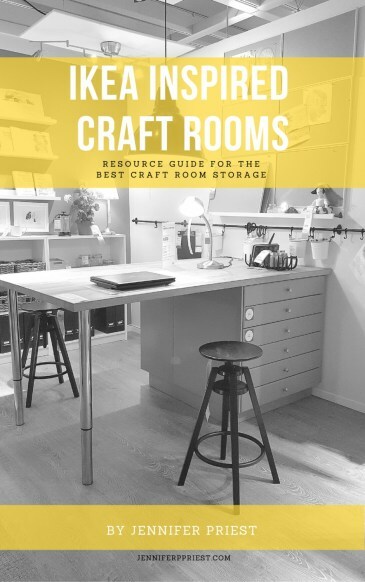 If you are a crafter, you probably already have most of the tools listed below. If you don't have them, click the links below to find them online. The felt measures 37″ wide when folded in half (it comes off the bolt in the store folded). 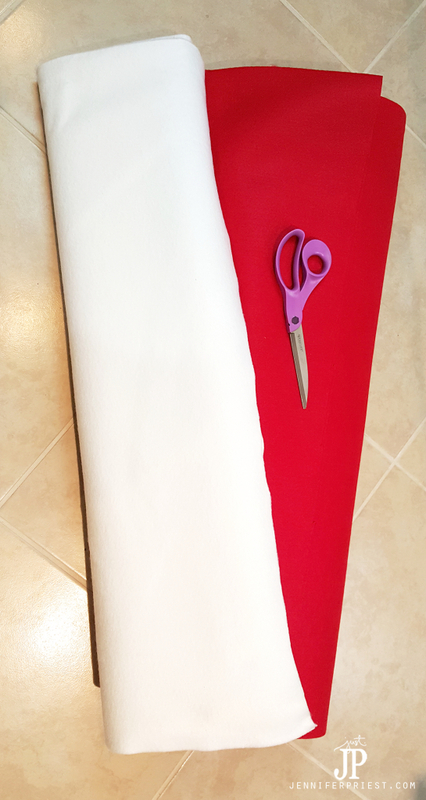 Fold the 2 yard piece in half again, the other direction so that the big piece of felt is folded in quarters. Tie the string to the marker. Measure along the string, 37″ from the marker and put a safety pin through the string. Put the safety pin through the corner of the felt, where all the folds meet. Trim the felt along the INSIDE of the curve so the marker line won't show. Cut a curved line at the folded corner of the felt. You can shorten the string to 6″ and repeat the process for drawing the larger curve if you are worried about cutting a perfect curve. I just eyeballed it. This will form a donut shape – a circle with a hole in the middle. Cut a slit from the outside of the of the donut to the center so that the skirt can be slipped around the bottom of the tree. Decorate with appliques, puffy paint, ribbon, and trims or just leave the skirt plain. There's no need to add a closure to the skirt – overlap the ends of the skirt slightly and press together with your fingers. The grabby nature of felt will keep the skirt in place. If you want to sew a tree skirt, I recommend this DIY Tree Skirt Tutorial from Design Sponge. How BIG is your tree!? Let me know in the comments!! And if you MAKE this Giant DIY Christmas Tree Skirt, please head over to our Facebook Page and share your photo there!! This was unbelievably easy!!! 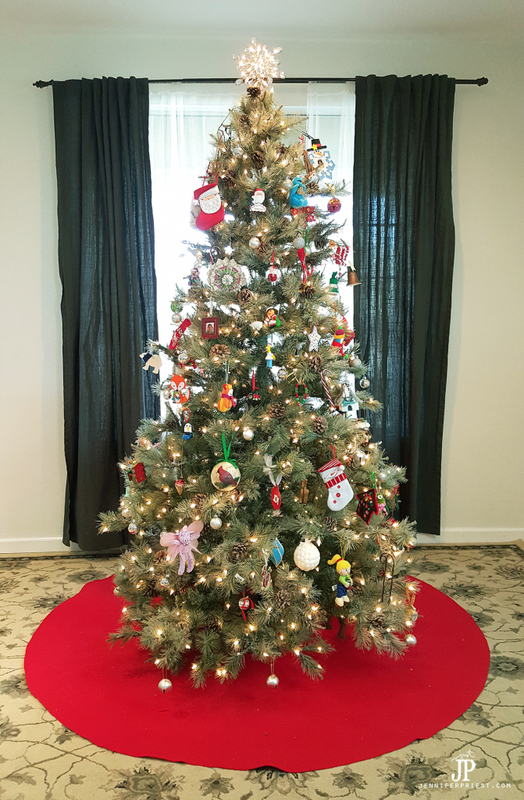 The six foot circle is huge and plenty big for a 10′ real tree! I cannot believe how many years I put up with a REALLY ugly skirt I made about 30 years ago… THANK YOU SO MUCH!!! OMG this is awesome!! I’d love to see a photo 🙂 Can you post it to facebook.com/smartfundiy please? Great idea. 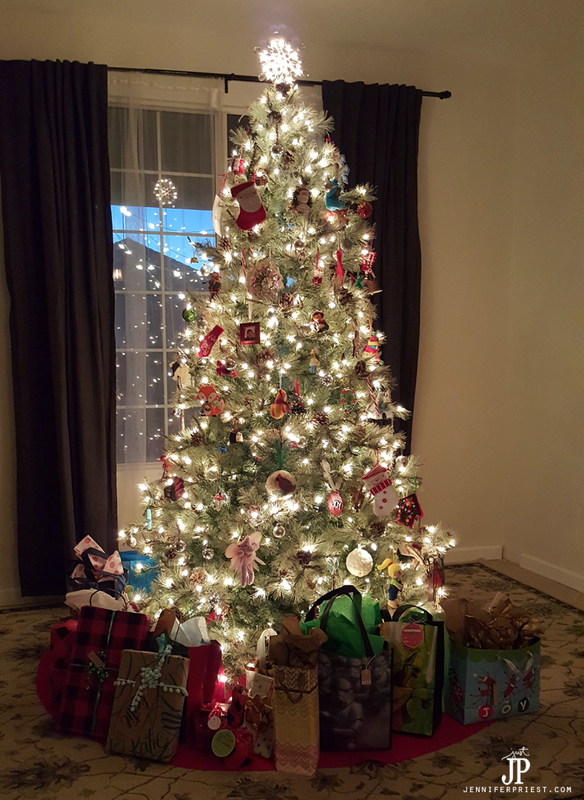 Purchased tree skirts are too small, but this one works to provide a place for gifts!